HOME ＞ CURRENT EVENTS ＞ March Birthday Party! We had the March Birthday Party today! It was so much fun and we were so glad to say, “Happy Birthday” to all our IYK friends. With the March birthday party finished, all of the IYK children have celebrated their birthdays here during this 2016 – 2017 school year. Before the party, we announced art contest winners. 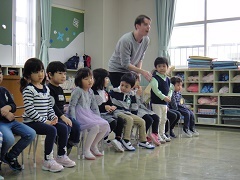 Then, all 12 of the birthday children did excellent saying their names and ages. They all got presents and we sang “The Birthday Song”. 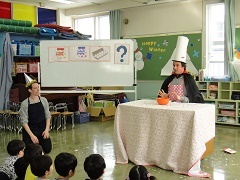 After that, we had a play where the English teachers made a cake. Many children laughed and seemed to enjoy it. 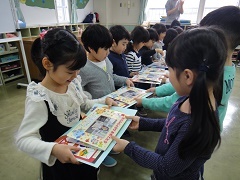 When everything was finished, the IYK children presented a “Thank you” gift to Saito-san, one of the ladies who makes our yummy lunches each day. Good job today everyone and Happy Birthday!